Rhett with Nice Ash planes sent me a plane to review which I was happy to do. The only thing I’ve used close to this plane is a Krenov plane I made with a hock iron. This plane I received works far better than the one I made in many ways. Upon opening the package the initial presentation was pretty nice. The package was wrapped in paper and sealed with a pretty cool sticker. The plane is shrink-wrapped which I assume is for stability. 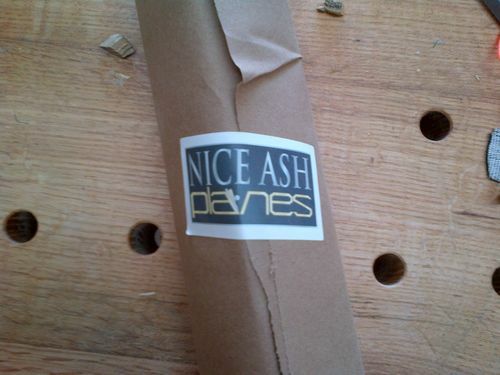 It even comes with a rolled up ash shaving indicating it has been tested and ready to be put to work. At first glance the shape is a basic rectangle but there are a lot of subtle details that are really nice. The sole is flat and the sides are square to the bottom. The top edges are nicely rounded and are quite comfortable in the hand. 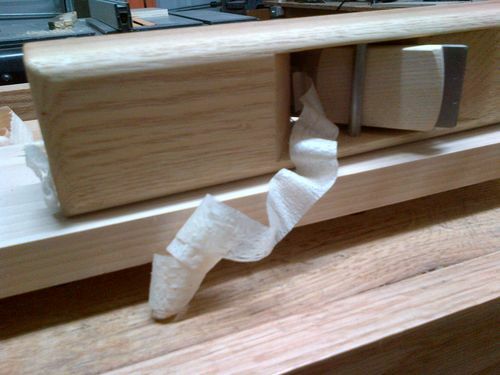 The plane is laminated from two parts. The rod that holds the wedge doesn’t show on the outside which is an interesting detail that must add some complexity to assembly. One interesting detail is the space behind the blade which gives the plane a unique look while also giving your adjustment mallet more clearance. 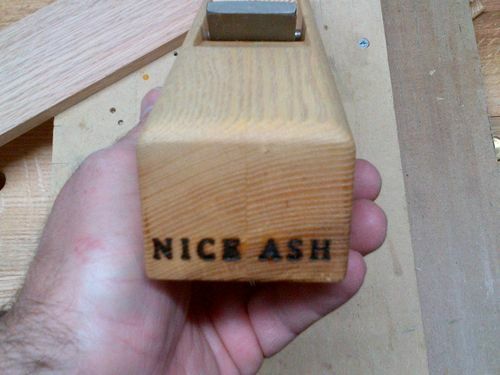 The “Nice Ash” brand is burned on the back of the plane. I think it would look better with finer lettering but my wife though it looked perfect so that’s just a matter of tastes I guess. Blade: Is a very thick 1/4” O1 steel that is sharp and shaves hair right out of the box. Its hollow ground with a polished micro bevel. The back appears to be polished with the ruler trick just at the cutting edge which is fine by me. The blade is only 1 ½” wide. 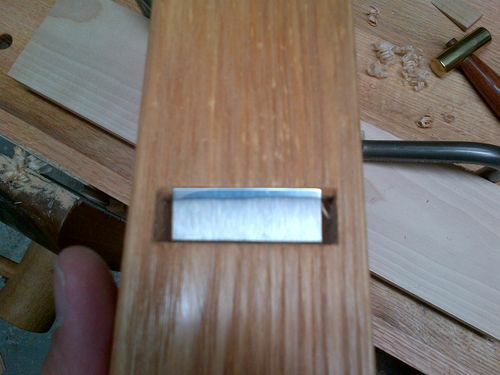 Not my ideal width for a jack but works fine for shooting end grain and jointing edges. 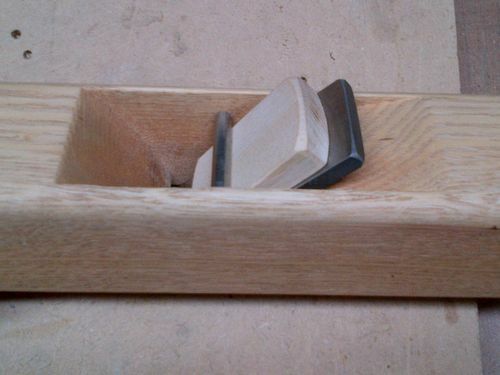 It would also work well with a heavy camber for rough work but this plane is much to refined for that. I’ve made a bunch of shavings with this plane including end grain and so far I have found the edge retention to be excellent. Size is a little shorter than a #5 at 11.75”. 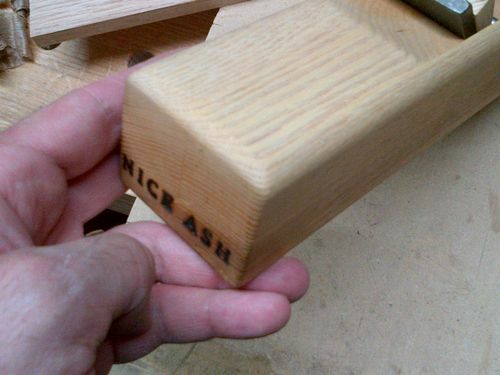 The website says that the Jack Ash plane is 12.5” so that is a little inconsistent. Not a big deal to me though. The mouth of the plane is extremely tight. I was very surprised that even though the mouth is very tight I never had one issue with the mouth clogging. Even with thicker shavings. (Clogging is a big issue with my shop made Krenov plane and it has a very wide mouth). Also the “wear” in front of the cutting edge slopes backwards which means that the mouth will stay tight for a long time as the sole wears down. The attention to detail on this very important feature was quite impressive. Blade adjustment was very easy with this plane. 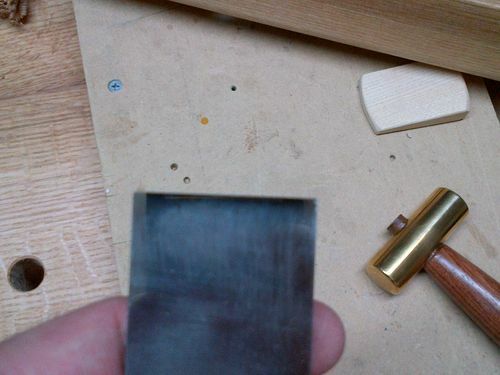 I’m not sure if its due to the steel rod that holds the wedge but the plane is very responsive to slight adjustments with mallet taps on the front and back of the plane. At the same time I had no issues with blade shifting while in use. The shape of the plane was also very comfortable and functional, even with the corner of the plane in the palm of your hand. 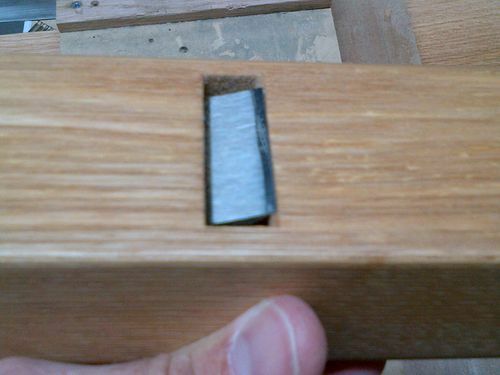 -Edge jointing in the vise. The sides offer a lot of vertical reference surface while allowing you to use your fingers as guides on the side of the board. I jointed a 3’ foot long board and had only a couple of thousands of an inch concave. 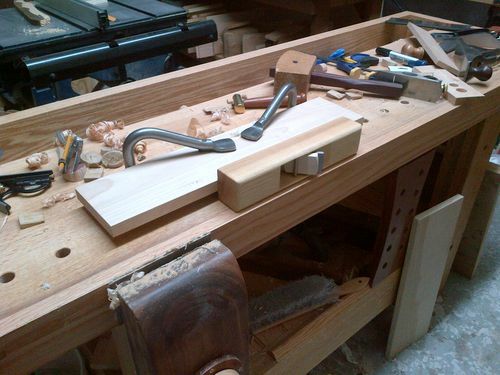 This is perfect for sprung joints so this plane makes a great small jointer. -This plane actually does pretty well on the face of boards for general flattening/smoothing but would not be my choice for difficult grain. I got a lot of roughness in front of knots in a walnut board. The only negatives I could find on this plane was the excessive space on either side of the blade. However, Rhett has informed me that this will be corrected on future batches. 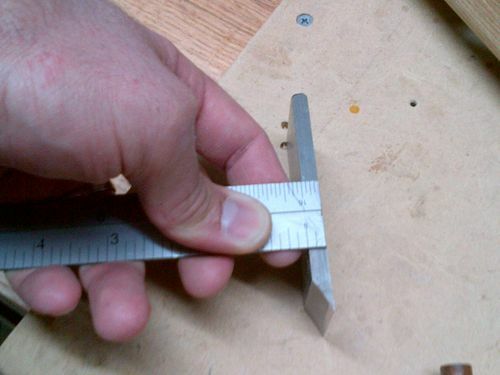 This could also be corrected with a 1.75” wide blade which I would prefer. However this didn’t affect the performance of the plane in any way and actually helped me get more of the cutter centered on the stock I was edge planing flat on the bench. 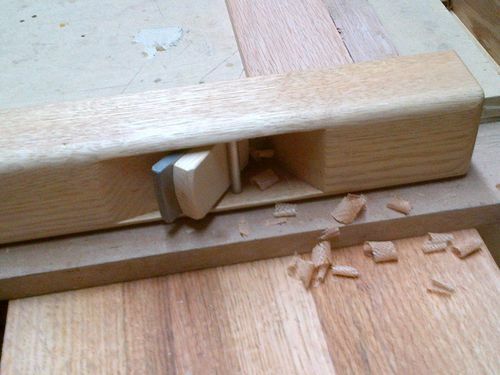 Some people like using Jack planes as smoothers, this one will do ok for general work but it did not do so well on very difficult wood. 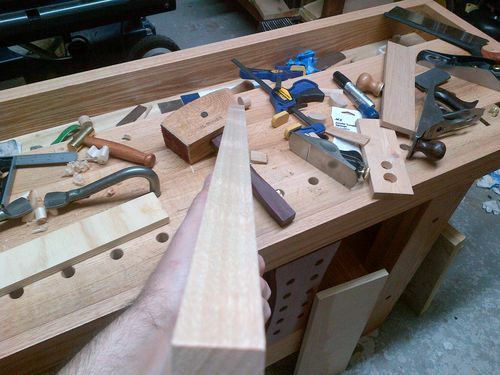 For that I would use something with a higher cutting angle anyway so I can’t knock this plane very much for that. So in Summary, after using this plane quite a bit a came away thinking “Man I need some more wooden planes”. This plane was such a pleasure to use and it worked great for a wide variety of tasks. I liked the length and width of the plane but would prefer to have a blade that is at least 1 ¾” wide which would fix the issue of the gaps on either side of the blade. The lack of chip breaker on this plane was not as much of an issue as I thought it would be. 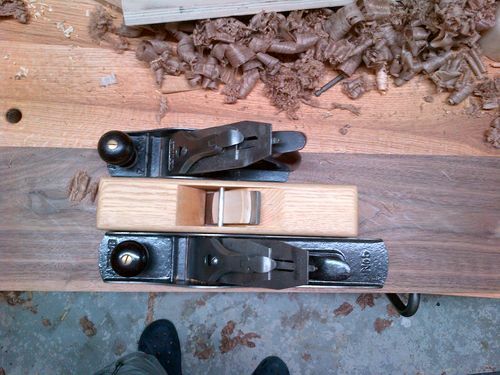 I now believe they are not very necessary on blocks, jacks, and jointer planes. I would still want one on a smoother. The bottom line is that the plane is a great value considering the quality of the blade you get and the craftsmanship on the body of the plane. 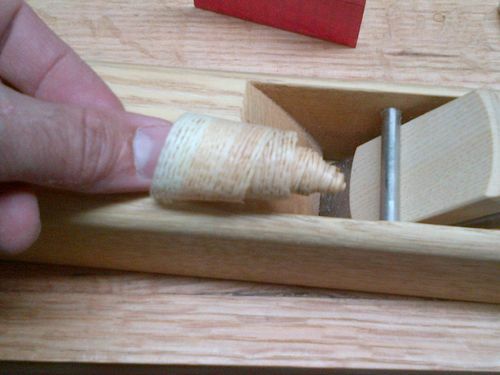 Heck, a Hock plane kit will cost you about the same as this one and you still have to build it! If I could give this plane 4.5 stars, since I cant I’ll round up and give it a 5 star. I loved the plane and see myself using it quite often. I highly recommend it! Thanks for the review, I’m happy you liked it. I am even more happy the changes to the wedge kept you from having creep. Right now, the entire line is 1.5” blades. That was to keep things simple at the start. We hope to expand sizes as time goes on. -- Doubt kills more dreams than failure. A well thought out review, thanks Mauricio. Looks like a great plane to have. Ash rocks. Well done. Too bad you can’t do reviews for a living. Very nice..looks like it would make a nice shooting plane…I use a veritas # 5 now, but dont like it at all..how does it feel in the hand while shooting ? great review. I’d like to make one note about chip breakers on smoothers. You won’t find a chip breaker in the Ron Brese line. I’ve been converting my infill’s to thicker irons with no chip breakers and can’t tell the difference. Give it a try. Nice insight Mauricio. Does this make you a professional reviewer? Rhett, its working great, it holds the wedge tight while allowing easy adjustment which is very nice. How do yall get that mouth so tight! It was impossible to get a picture showing daylight through the opening. I thought for sure I would get clogging but it worked perfectly. Widdle it feels very nice in the hand but my hand does want to slip so I press a couple of fingers against the front “escapement ramp” (is that what is called?). You know in font where the shavings come out. A plane of this size and shape with a knob you can screw on for shooting would be perfect for shooting. Don, that might be true but don’t yours and Ron Brese’s planes have higher angle blade bedding? That would make a difference. I’ll take steeper bedding over a chip breaker if I can only have one. good point Mauricio. Now you’ve given me more testing to do. I enjoyed that. I believe you covered all the bases.